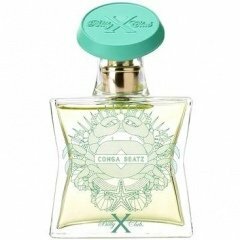 Conga Beatz is a perfume by Billy X Club for women and men and was released in 2015. The scent is gourmand-citrusy. Projection and longevity are above-average. It is still in production. Oha - a fragrance that is over three years old and has neither comment nor statement. Yes, even the brand Billy X Club with meanwhile eight fragrances has been ignored without comment so far. I admit that it was only at the beginning of this year that I learned about this Belgian label for the first time at the perfumery conference and got a few samples. And because we can still experience the end of a wonderful and on the other hand memorable summer of the century in the next few days, Conga Beatz still seems to me to be ideal for a small performance. Maybe I am not the only one who has to think of the title "Conga" by Gloria Estefan & Miami Sound Machine with the chorus "Do that Conga Beat" in the middle of the 80s. It also has something very saucy and summery, just like this Eau de Parfum, which rejoices with apparently freshly peeled Floridian oranges and continues to develop with tangerine - only more in keeping with the times. There is also a fat exchange of blows between lemon and grapefruit, as well as a sour counterpoint with the tomato leaf and a floral accompaniment in the form of some jasmine with rose. The whole thing with the peach lurches dangerously close to the border to a girl's scent, but can just be worn with a good portion of tolerance by men. Finally, a mini pinch of sandalwood and a few drops of musk provide some balance. More oakmoss or its substitute would have been very welcome here. There is also nothing negative to report on the popular topics of durability and projection. You may wonder how much the ingredients are of natural origin, but they are by no means synthetic or cheap, and certainly not annoying or annoying. I doubt that the label Billy X Club will become a cult here or somehow cause a furore. The scents advertised are even too down-to-earth according to their own statements, which is also reflected in the prices between 63-68 € for 50 ml. Nevertheless, I find Conga Beat especially summery-sympathetic. Drumroll on it! Write the first Review for Conga Beatz!